@s.a.t is on Carousell - Follow to stay updated! 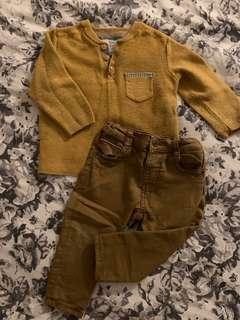 ZARA baby boy size 6-9months mustard long sleeve knit with button front detail. Paired with caramel denim skinny jean. Too bad it don’t fit my little man no more. Alice McCall vintage archive. Super cute short dress in black with hand beaded embellishments and slight bell sleeves and cuff details. Pre-loved/vintage piece. Leonard ST. Suede short dress with fringe detail. Beautiful fabric quality in taupe colourway with zip up back. Pre-loved/vintage piece in good condition. (Very discreet pen marks on bottom front and RHS bust dart) Cold handwash separately or dry clean only.